I’ve recently been contacted by every business that I’ve had so much as a passing glance at. Everybody from my local takeaway to electronics stores (whom I only subscribed to in order to enter a competition) have been filling my inbox to bursting point. There are only so many times a person can read the subject line “Important information about the way we contact you” or, objectively worse in every way, “Can we still be friends?” before it all becomes white noise. 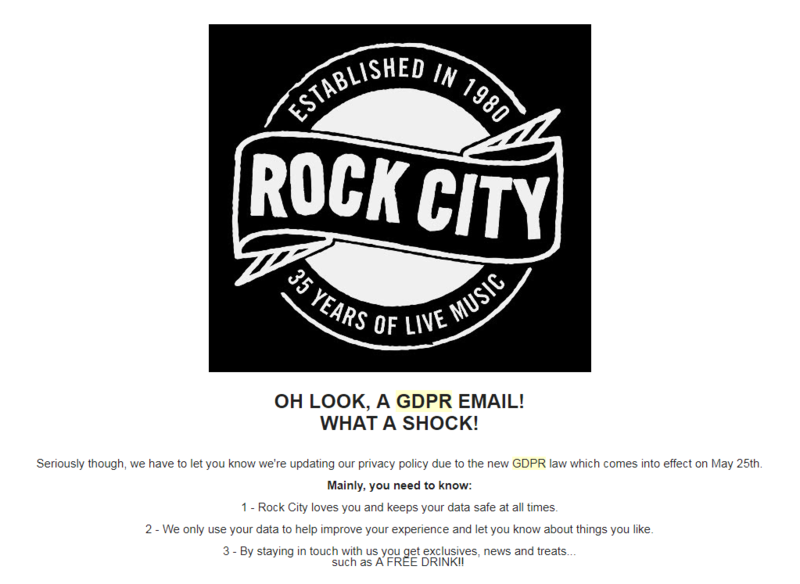 Whilst the deluge of emails has been a lot to deal with, GDPR presented us all with an unrivalled opportunity: the opportunity to truly cleanse our inboxes. 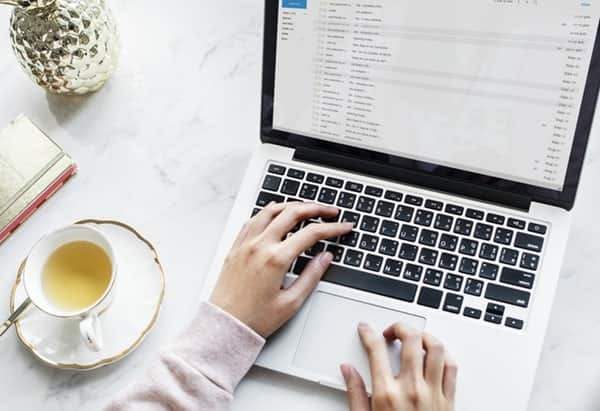 The point of the General Data Protection Regulation was to make sure that businesses can only contact us and continue to do so with our explicit permission. We may at some point have thought that weekly emails from Subway were a great opportunity to keep up to date on the latest news and offers in the world of sandwich-making. Now, though, we don’t even open them. We all make mistakes. Addressing the fact that that you’re doing an annoying but totally necessary thing upfront will always earn you points in my book, and the chance to win a free drink isn’t too bad either. Rock City: 6 out of 10. Not only did Creativepool tempt me into the opening the email with chance to win pizza (which always wins over a drink!) they proceeded to reward my efforts with a mildly amusing meme! 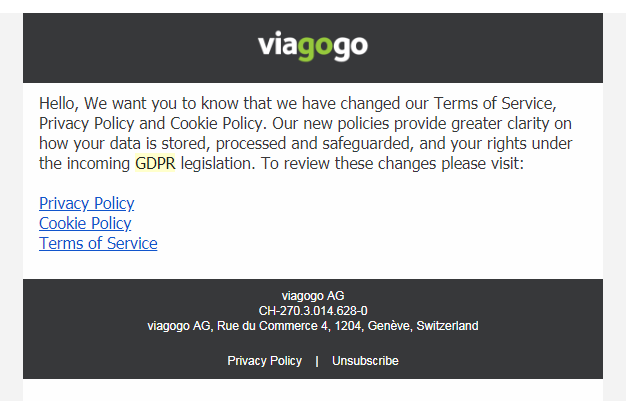 I’d give them a solid 7 out of 10 for effort, which might as well be 25 out of 10 when the GDPR offerings from other businesses are considered. I’m looking at you, Viagogo. Yawn. The content may be true, but surely there were more engaging ways of encourage me to give my consent? Dear oh dear. 1 out of 10 for the (very little) effort. 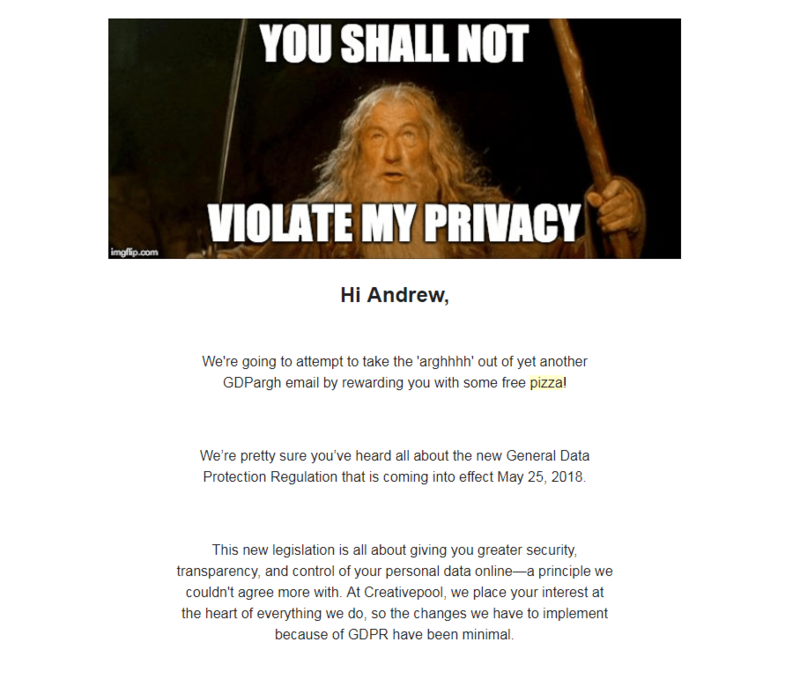 So who impressed you during the great GDPR spree of May 2018? Let us know!